The president picks his first U.S. Supreme Court nominee, and both Wisconsin Senators are involved in the confirmation process. Federal appellate Judge Sonia Sotomayor of New York is the choice to replace retiring Supreme Court Justice David Souter. United States Senator Russ Feingold (D-Middleton) says he needs to study all the facts before making any decisions, but he already likes what he knows about Sotomayor. The Middleton Democrat is a member of the U.S. Senate Judiciary Committee, which will hold hearings on President Barack Obama&apos;s appointment for the High Court. Democrats have the majority in Congress, but Feingold says confirmation is not necessarily not a guarantee – although, Sotomayor has been through this grueling process before. 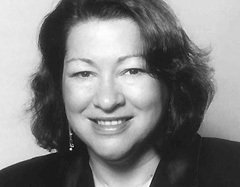 If confirmed, she would be the first Latina to sit on the nation&apos;s highest court. Confirmation hearings could get underway in June or early July, after the familiar FBI background check. Thanks to Paul Knoff, WCCN Neillsville for contributing to this story.